You could fit a race tacho like the Scitsu. These are powered by an internal re-chargeable battery and the pick-up/sensor wire is placed alongside the HT lead. They can also be powered by the bikes electrics if fitted or an external PP3 9v battery. Scitsu tacho's are a very common choice in the classic race world. Hello everyone. I haven't been on this forum in ages. I am still loving my T500 cafe racer. I sorted it all out this past summer and can't wait for next driving season. It looks fantastic. What bike is the tank off? 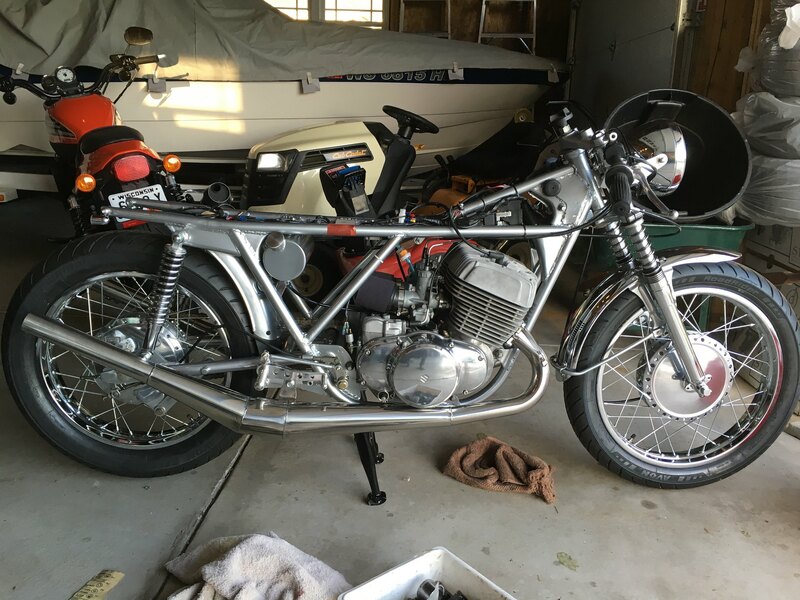 Its off a 1977-ish yamaha XS750. I really love that particular tank. Its big (almost 5 gallons), and it has a great shape with knee dents built into tank. I also like that it has a HUGE tunnel, so it can fit over almost any frame backbone or engine. One more thing I like is that it has fuel outlets on both sides, so you can easily run one line to each carb without using a T fitting. Pingel makes an adaptor that works with this tank, allowing a simple gravity petcock to be used. Overall, I cannot say enough good things about these tanks. Oh, and they also make reproduction, brand-new gas caps for pretty cheap too. Last edited by sbaugz on Thu Dec 07, 2017 6:50 pm, edited 2 times in total. 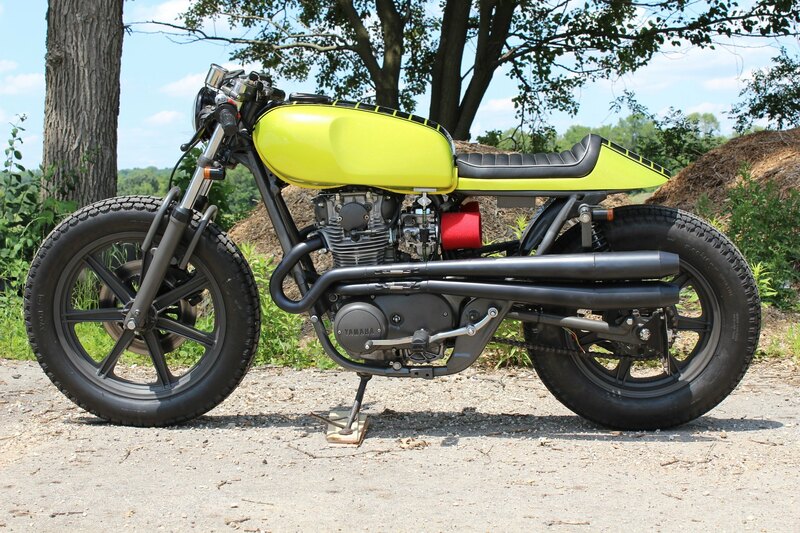 i used the same tank on a XS650 build a few years back too. 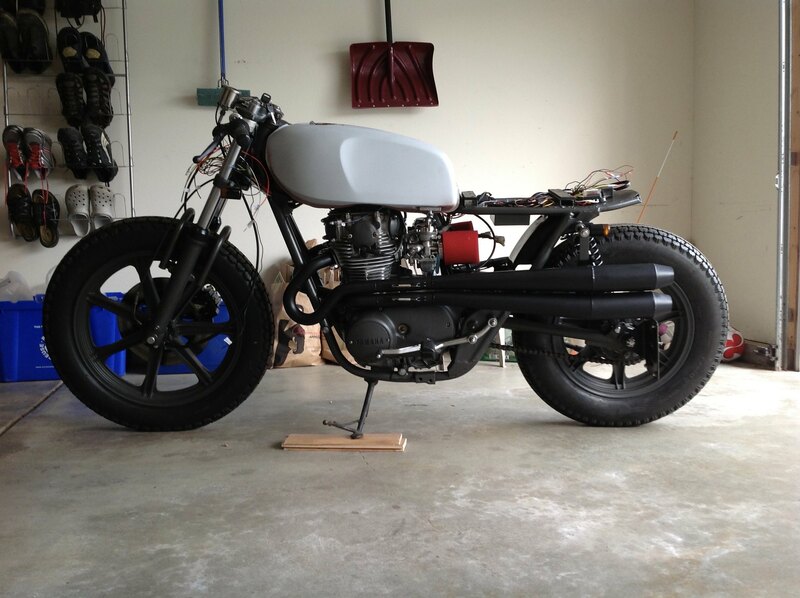 It was easy to swap the mounts around and configure the XS750 tank to work with the XS650 frame. Do you have pics of the tank mounts you used? not really. I have some pics below but they don't really show the mount all that well. 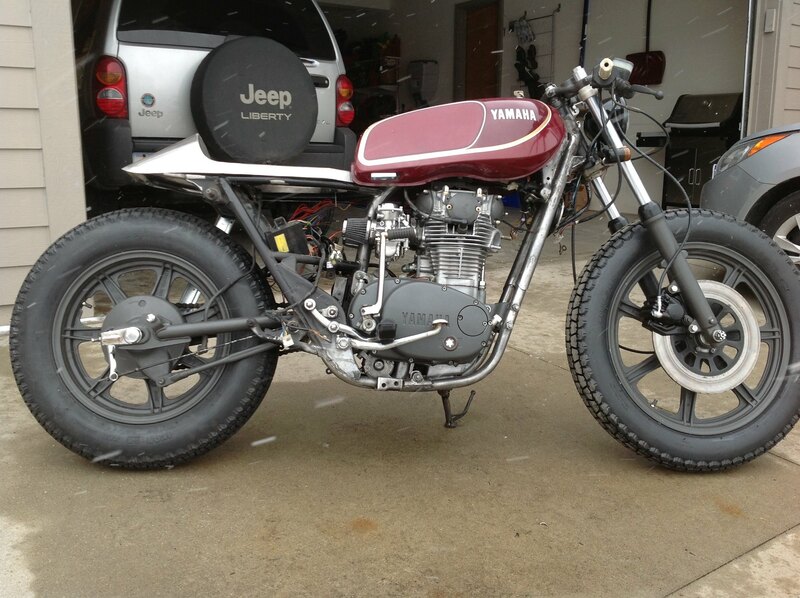 The XS750 tank uses a cup piece on the tank and the rubber puck is on the frame. You then have to figure out a way to get those pucks mounted to the frame. In the case of the T500, it was pretty easy. The width of the frame happened to be the exact width between the mounting cups on the tank itself. All you have to do is mark where they should go. I then welded a steel rod to each side of frame. See first pic below. Then you place the rubber puck linked above onto the steel rod (see second pic) and the tank slides right on. Its hard to explain, but easy to figure out. Take note of the location of the new mounts compared to the stock mounts which are still on the frame slightly in front or and below the new mounts. Aahh. 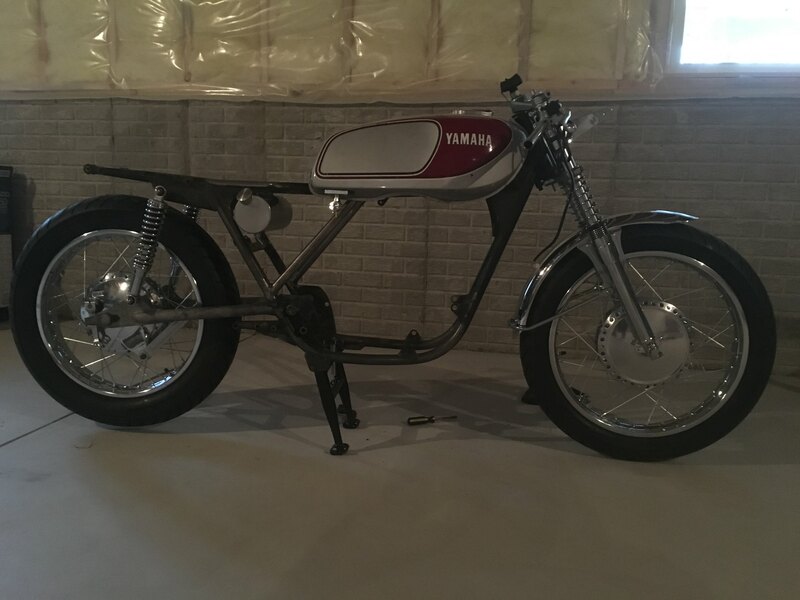 I thought it might be from a Yamaha. I saw a similar tank on a Custom Triumph that came from a Yamaha. It looked great on that too. after enjoying this motorcycle for two years, I decided to let it go. I tried on ebay and craigslist with no success. Ultimately I listed it on bringatrailer and the response was overwhelmingly positive. When the "hammer fell", I walked away with $12,100 for the bike! I could not be more happy with the outcome. The bike will be going to New York to join a collection that includes a Yamaha RD and Kawasaki H1. Thanks for all the help that everyone has provided here. 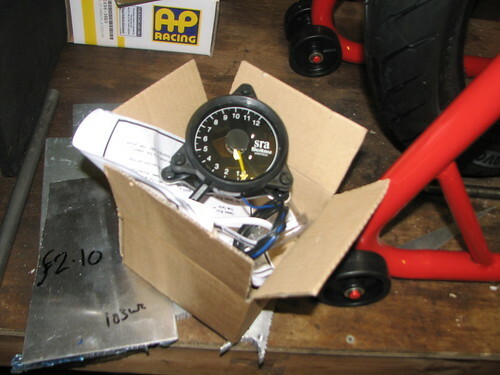 I will be posting a bunch of T500 parts here in the upcoming days- including oil pump and lines, clutch basket, stock exhaust and headers, and a bunch of other parts. Congrats. I would not have guessed anywhere near $12k. Are you going to do another build? 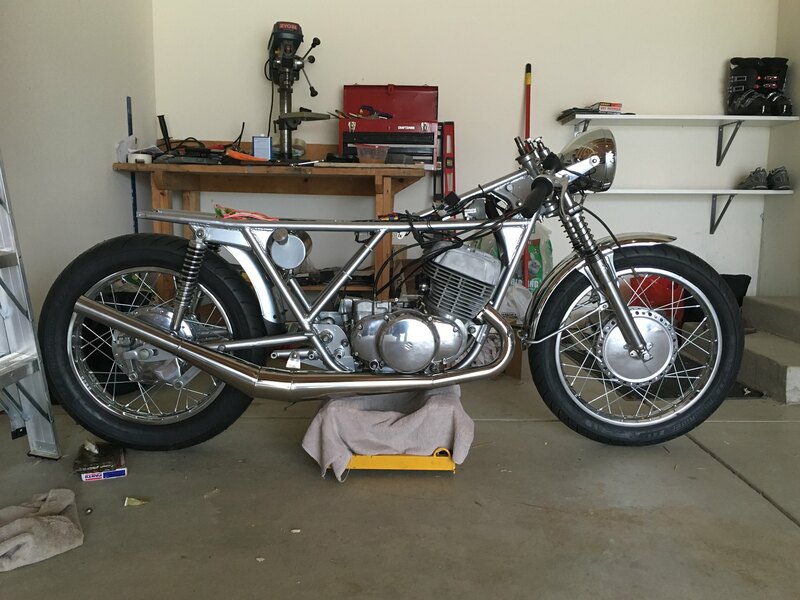 How did you mount the shortened rear fender? I see the stock lower mount. But what did you do at the top? I used part of the stock rear fender. I cut about 1/2 of it off and mounted underneath frame rails. Check out the pics from my bringatrailer auction above. There should be a pic taken from back of bike that shows underneath the seat pan. Thanks. The pic shows a bolt at the top of the rear fender.